hockey team, was shadowed by a Canadian film crew last year. VANCOUVER, British Columbia — The dated but majestic Pyongyang Ice Rink is adorned with timeless symbols of a country in isolation. In the arena’s upper bowl, portraits of North Korea’s past leaders, Kim Il-sung and Kim Jong-il, hang like championship banners. On the ice below, the national men’s hockey team often simulates a five-on-four penalty killing drill that was introduced to the North Koreans by the Soviets several decades ago. Over the past year, five Canadian filmmakers have often been at the rink with the team, sometimes even on the ice. They are documenting the slap shots and the post-practice speeches, but are also trying to peel back the layers of a long-existing hockey subculture in one of the world’s most mysterious nations. Why were their pads and equipment old? Why did they repeatedly run the same predictable plays? Where did these players come from? The opportunity to get answers to those questions raised even more. How did a film crew from Vancouver, British Columbia, acquire unparalleled access to shadow North Korean sports teams? at the Pyongyang Ice Rink. Matt Reichel, one of the film’s producers, worked and lived in Asia on and off over the past decade. A 2009 graduate of Brown University’s international relations and East Asian studies program, Reichel started nonprofit and digital marketing ventures while living overseas, building connections in the process. He estimated that he had been to North Korea more than 60 times. On one of those visits, he discovered that North Korea had a pastime in common with his home country. “I saw that there was a hockey tournament one year around the time of Kim Jong-il’s birthday, so I decided to go check it out,” he said. Back in Vancouver, his hometown, Reichel teamed up with Edwards, a former television production assistant. 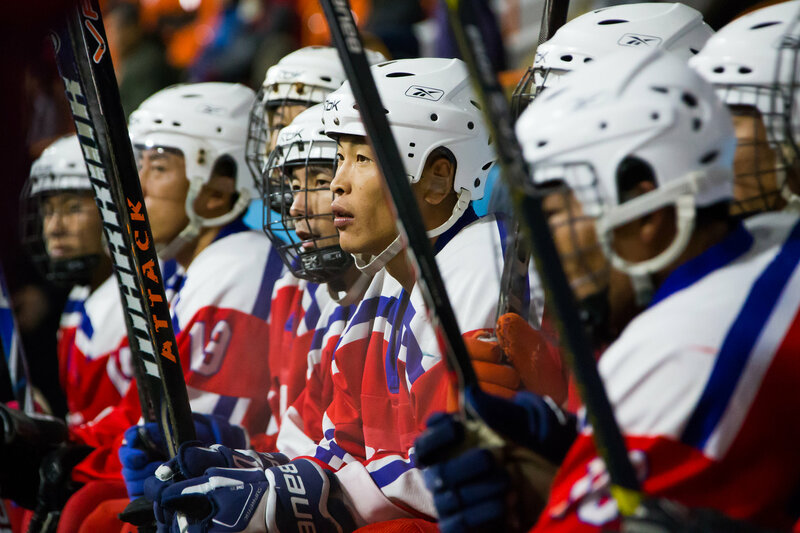 It took two years of leveraging Reichel’s contacts and forming new ones with the Ministry of Sports and the Korean Ice Hockey Association, a league of seven clubs, for the filmmakers to get permission for the project. 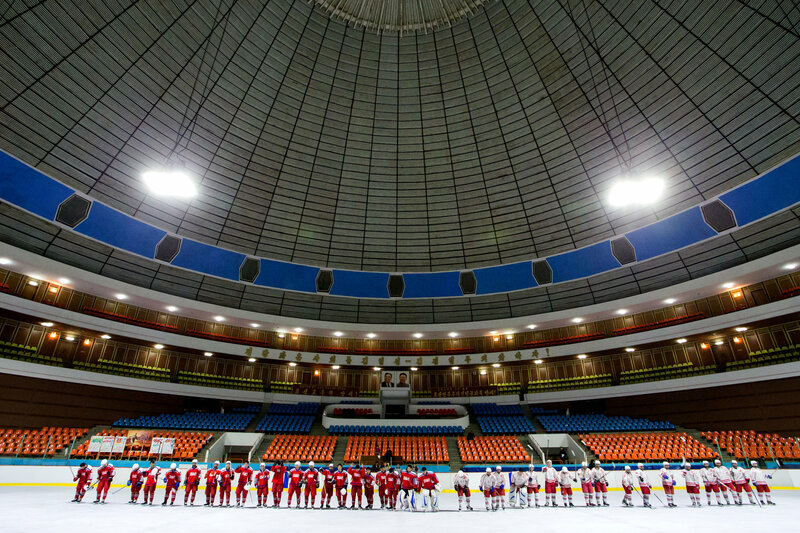 In November 2016, the production crew went on the first of three trips to Pyongyang, the North Korean capital, to shadow the men’s national team and a professional team, Taesongsan Winter Sports Club. Reichel and Sunny Hahm, an associate producer, a translator and a Seoul native, provided insight into North Korean culture for the new visitors. “They told us the first time you go there you’re a stranger, the second time you’re a friend, and the third time you are family,” Edwards said. Tournament of the Republic game against Pyongyang Choldo, right, in November 2016. To break the ice with the athletes during the first days of filming, the crew played the Canadian card. But Hahm, a competitive recreation hockey player, could skate and was critical to building rapport. Aside from being able to speak Korean, he often practiced with the Taesongsan team, making suggestions to the coach and players. In a game during the crew’s first trip, the Taesongsan coach presented Hahm with a jersey and an offer to sit with the team during the game, though Hahm did not play because of Korean Ice Hockey Association rules. For the rest of the crew, trust and relationships were built on consistency and gestures. Edwards made a point of learning each player’s name; in turn they remembered his. While shooting interviews, members of the crew were cognizant of their subjects’ skepticism. Every morning after breakfast, the crew made the five-minute trek from its downtown hotel to the arena. Many competitors in ice sports like speed skating, figure skating and hockey have the arena on a given day. The schedule is planned to the minute, Edwards said. haring the facility is efficient, but not conducive to ideal hockey practice. The ice is worn from overuse, and divots courtesy of the figure skaters are visible throughout the rink. The glass is scratched, and the boards lack compression. The hockey play is also behind the times. According to the filmmakers, North Korean teams still abide by the training materials and methodologies passed on from the Soviet Union in the 1950s. 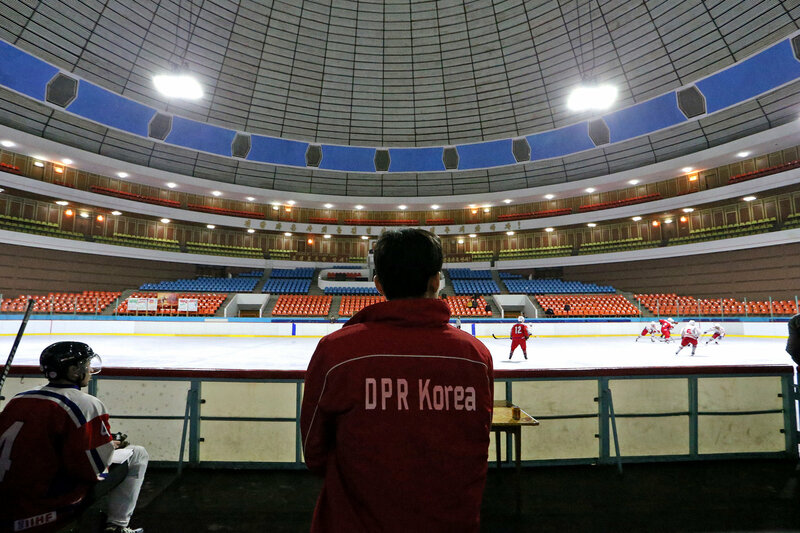 While South Korea’s hockey program has evolved in recent years, qualifying for the 2018 Winter Olympics as the host country, North Korea’s has remained stagnant. The lack of outside exposure and information sharing — televised N.H.L. games, foreign-exchange skills clinics and access to the internet — has significantly impeded the progress. “The vast majority of the team comes from the countryside, and they are recruited as kids 12, 13 years old, based on who has athletic talent in those small villages or towns,” Reichel said. Most of the team’s equipment is used and is donated by the International Ice Hockey Federation, which is based in Zurich. The film crew tried to help, contributing tape and new composite graphite hockey sticks. “We wanted them to feel they were on equal levels of playing,” Hahm said. What the North Korean players lack in knowledge, gear and size (no one on the national team is over six feet tall), they try to make up for through discipline and heart. The filmmakers shadowed the Taesongsan team for 11 days during their first trip in November. When they returned to film last spring for three weeks, they focused on the 20-man national team, which was training for and competing in the I.I.H.F. world championship in Auckland, New Zealand. team shares the facility with other clubs and with athletes in other ice sports. A Division II team in international competition, North Korea was in a pool that also included China, Israel and Mexico. Hong, the fastest and most skilled player on the team, scored a hat trick in North Korea’s only victory in Auckland — an 11-3 win over Turkey. The team had sustained several injuries, mainly from the intense play against bigger and stronger opponents. The yearly change of scenery for international tournaments provides an opportunity for the players to explore things they cannot find in Pyongyang. In December, the crew will make one last trip to Pyongyang to conclude filming. The filmmakers are seeking a distributor and hope to show the documentary at the top film festivals next year. He added that he did not expect the recent rising tensions between North Korea and the United States to have much impact on the players’ day-to-day lives. “They are all seeking what we all seek, which is self-worth,” Edwards said. “They are just looking for a place to prove themselves, and that, for them, is winning gold on an international stage. Even though, how realistic is that? The Russians didn’t need long to draw even though as new recruit Dmitri Samorukov (Guelph Storm) blasted a point shot past his OHL counterpart Dylan Wells (Peterborough Petes) in the Team OHL crease. The tying goal came off a Russian offensive zone faceoff win as the game was knotted at one at 7:31. One dream has been put on hold. Another is about to begin. 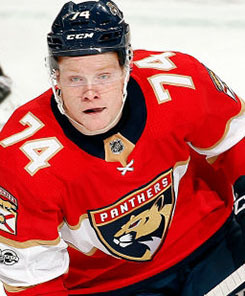 A day after the Florida Panthers returned Owen Tippett to the Ontario Hockey League, the 10th overall pick in this year’s draft was back practising with the Mississauga Steelheads on Tuesday. If he was bitter or disappointed, he didn’t show it. Instead, Tippett was already looking ahead to the next challenge: winning a spot on Canada’s roster for the world junior championship. Tippett, who unexpectedly made Florida’s roster out of training camp, scored a goal and had 17 shots — only once did he fail to register a shot — in seven NHL games for the Panthers. At times, Tippett looked like he might stick. He had seven shots in his NHL debut. On his goal, he showcased his speed when he grabbed a turnover and sprinted up the ice before converting on a give-and-go against John Gibson of the Anaheim Ducks. But he was in and out of Florida’s lineup; he averaged 11 minutes of ice time and watched nearly half the games from the press box. At 18, Tippett needs to play so he can develop. That’s why he was sent back to junior on the same day the Edmonton Oilers returned 22nd-overall pick Kailer Yamamoto (no goals and three assists in nine games) to the Spokane Chiefs of the Western Hockey League. The hope now is that both players will represent their respective countries — Yamamoto is American — at the world junior championship, which begins in Buffalo over the Christmas holidays next month. For Canada, getting a player with NHL experience, even if it’s only seven games, is a benefit. “I think they came back with tremendous confidence. That’s first and foremost,” Hockey Canada head scout Brad McEwen said in a phone interview from Swift Current, Sask., where he was watching the first leg of the Canada-Russia series. While it appears no draft-eligible player will find his way onto Canada’s roster, McEwen is “crossing his fingers” that several players currently on NHL rosters will be made available. Some, such as Columbus forward Pierre-Luc Dubois and Montreal defenceman Victor Mete, are long shots. Others, like Colorado’s Tyson Jost and Samuel Girard, could be last-minute additions. The biggest name out there is No. 2 overall pick Nolan Patrick, who has played nine games with Philadelphia, but has been out of the Philadelphia’s lineup since Oct. 24 with a head injury. Once healthy, the Flyers have to decide whether to keep Patrick past the 10-game threshold or return him to the WHL’s Brandon Wheat Kings. Another question mark concerns Michael McLeod (12th overall, 2016). The Devils prospect tore his meniscus during a pre-season game and has been recovering from knee surgery ever since. It’s doubtful New Jersey will keep him around once he’s healthy. The Matt Duchene trade could affect whether Canada ends up with a couple of key players. At one time, it looked like Jost (10th overall, 2016) might become available, since he was in and out of Colorado’s lineup and averaging only 13 minutes a game. But with Duchene gone from the Avalanche, Jost could see an increase in ice time moving forward. Another difficult assessment concerns Girard (47th overall, 2016), who looked like he would be loaned for the world juniors after getting demoted to Nashville’s AHL affiliate. But that was before he was traded to Colorado. “Now that Samuel’s been traded, I don’t know what the plan is there, and that’s fine,” said McEwen, who is also keeping an eye on Mete’s declining minutes with the Canadiens. “He played a ton of minutes early and now it’s come down. For me, that’s not an indicator of whether we’re going to get him back or not. We’re just waiting and seeing where it all plays out. Canada’s selection camp for the 2018 world junior championship is still a month away, but it appears Carter Hart has the inside track on the No. 1 goaltending position. The 19-year-old, who is one of six potential returning players who won silver at last year’s tournament, posted a shutout in a 7-0 win Monday in the Canada-Russia super series in Moose Jaw, Sask. It was a good first step for the Philadelphia Flyers prospect, who had played sparingly this season because he had been sick with mono. Hart, who was selected 48th overall in the 2016 draft after being named CHL goalie of the year, is expected to battle Vancouver Canucks prospect Michael DiPietro for the starting job.